Here's the map to my oubliette. These strange things happen all the time. It was decently sunny outside today, and with a lot of things in Spain closed on Sunday, it seemed like the perfect day to have beers on the terrace. Typically, when I’ve been going out to bars I just simply order cerveza and take whatever they give me. Normally this is Estrella Damm which seems to be the Spanish equivalent of Miller Lite in that it’s very cheap, not heavy at all, and doesn’t taste like a whole lot. Regardless, it sort of seems to be the standard cheap beer, so it’s what I’ve been drinking. 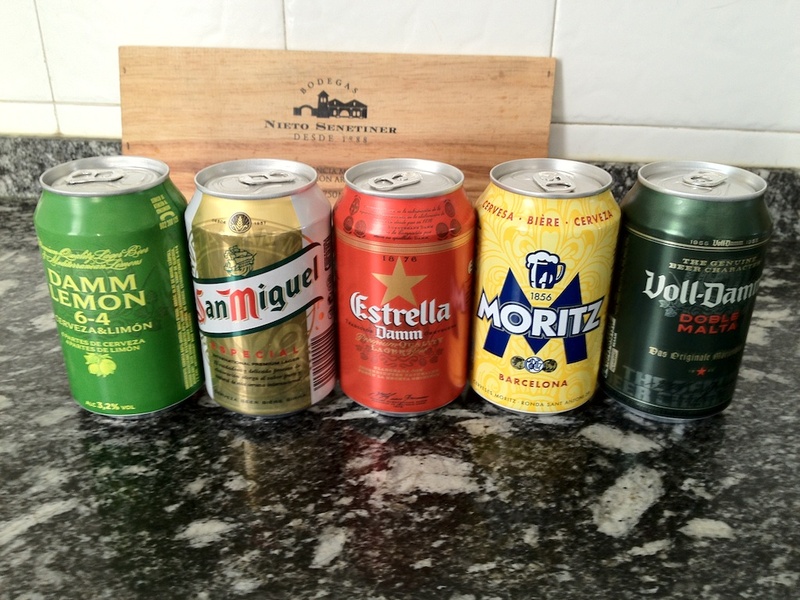 However, the corner store has all sorts of cheap beer, and today is a perfect day for a Spanish beer smorgasbord. I’ve love to provide some lengthy and obnoxious Beer Advocate review of each of them, but honestly, they all seem so similar that you might as well just pick whatever can design you like best. The one exception would be Damm Lemon, but that’s just the Spanish answer to something like Bud Light with lime. Oh, I also stopped by the awesome little produce shop I’ve been going to and my American-loving English-speaking Pakistani fruit buddy was in rare form today. He went through his whole English welcome, which amounts to something like “Hello, good afternoon, how are you doing today, thanks for coming,” all spewed out incredibly quickly in one barely recognizable phrase. We talked for a while, and when I paid I gave him a US dollar in addition to the Euros used to pay for my stuff, which he thought was really cool. It really makes me wonder how this whole Pakistani hierarchy works around here. He mentions he hasn’t been in Spain very long, which lends credence to the theory that these guys are brought over to work in some kind of Pakistani mafia peddling fruit, beer, butane, roses, and staffing corner stores. In that respect, it’s sort of sad that he wants to go to the USA so badly and I’m not sure if I’m sad for him or sad for me. I mean, the USA is just home and something I take for granted, but to him it seems to represent real opportunity. It’s hard to empathize with that, as being an ambitous white American male I’ve basically have had every opportunity imaginable available to me. It’s hard to imagine who I’d even be if I lived my life working my way up from the bottom of the rose cartel. Who I am both personally and professionally either in part or wholly is a direct result of the opportunity and to some extent the entitlement I’ve had as an American growing up in a good household. That’s strange to think about, as until you meet people like the fruit guy, you don’t really have a whole lot of reason to. The reason this pizza place near us is so incredible is because they cook what I’d describe as a really traditional Italian-style pizza. Whether or not that’s what it actually is, I have no idea. Either way, the crust is super thin, it’s cooked in a brick oven, with both minimal sauce and cheese. So, naturally, I expected their calzones to follow suit, but that couldn’t be further from the truth. Instead, what I got was this crazy American-football-sized dough lump, with what must have been two pounds of runny cheese inside. Oh, and ham, lots and lots of ham, which I guess comes with a plain Spanish calzone by default. It was honestly the first thing I’ve had to eat since I got to Europe which just wasn’t any good. I suppose I can’t really complain about a twenty five day run of great meals. Like most Sunday nights, I’m excited to get back to work tomorrow. I’m going to start taking GDC appointments, which is always overwhelming. I don’t even think I’m going to bother with email this year. I booked almost exclusively via IM last year which worked so much better. All in all, another great weekend!